Tiani Ramos will be shouldering most of the cost of her education and wants to take on as little debt as possible. What if you landed a spot at the college of your dreams, only to learn the cost would be nearly insurmountable? Would you reconsider a college lower down on your list if it offered you tens of thousands of dollars of merit aid? Should you opt for community college or a gap year instead? Those are the questions facing high school seniors and their families as they wrestle with where to go to college ahead of the May 1 deadline, when most students have to make a selection and put down a deposit. A lucky few have gained admission to their top-choice college with all their financial needs covered — either through financial assistance or their parent’s pocketbooks. But for the majority of students grappling with college options, money matters as much as a school’s academic reputation, the atmosphere on campus, and how welcomed students feel. The Globe spoke to several area students about how they’re assessing everything from financial aid packages to geography as they try to decide where they’ll land come fall. Chrisleen Herard, 17, was admitted to her dream school, Howard University, but the financial aid package has left her scrambling to figure out how, and even if, she could afford to attend. Chrisleen Herard, 17, was thrilled when Howard University offered her a seat in its class of 2022. The country’s premier historically black college had nurtured the academic aspirations of writer Toni Morrison, Supreme Court Justice Thurgood Marshall, and so many other prominent African-Americans that Herard believed she, too, could find a supportive learning environment there. Then she received Howard’s financial aid package. It left her scrambling to figure out how, and even if, she could afford to attend her dream school. 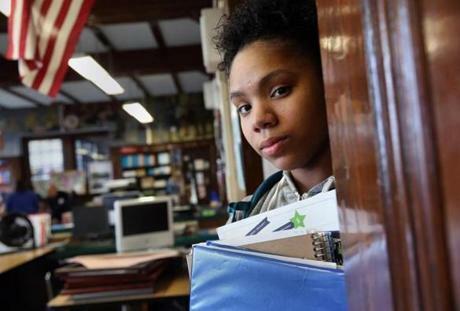 Herard, who lives in Dorchester and attends Boston Latin Academy, received about $26,000 in grants and scholarships from Howard, but she and her family have to make up the remaining $20,000 annual cost through loans. That’s no small sum. Her father, 73, no longer works. Her mother, a nursing assistant, earns a very modest salary, which — combined with Social Security payments — covers the family’s rent and expenses. Herard also works part time at a coffee shop to help. She has applied for six scholarships to close the financial gap and plans to appeal the aid decision to Howard. But winning that appeal could be a challenge. Interest in historically black colleges is at an all-time high, but many of these schools have smaller endowments and struggle to meet the financial needs of their students, many of whom require assistance. Herard has other private school options and was also admitted to the University of Massachusetts Amherst, UMass Lowell, and UMass Boston. Her out-of-pocket costs at the Amherst flagship campus would be about $13,000 annually, while UMass Boston would be the cheapest option, with its slightly lower tuition costs and her ability to commute to school. But she also wants the traditional college experience — life in a dorm and a chance to be independent and away from home. “Is Amherst the best option? Or should I just give in and stay at home and do what everybody is telling me?” Herard said. During her visits to 16 campuses along the East Coast and in the Midwest, Chloe McKee, 17, realized that the college admissions process was a business and she needed to be financially savvy. Chloe McKee, 17, didn’t bother applying to schools that weren’t likely to give her much in merit or financial aid. She didn’t bother applying to schools that weren’t likely to give her much in merit awards or financial aid. When she got into a slate of smaller private and state colleges, including Roanoke College, Fairfield College, Xavier University, Merrimack College, Salem State University, and Framingham State University, she and her parents looked closely at the financial packages. Her mom, a hairdresser, and her dad, a union pipefitter, planned to help McKee pay for college but wanted to keep the family contribution under $30,000 annually between parent loans, student loans, and savings. The McKees also have a younger child and have to worry about a second college tuition. Every opportunity McKee had to potentially reduce her cost, she took. 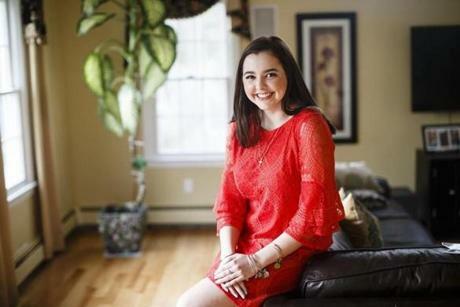 She entered essay contests that awarded scholarship money and went to a prospective student event at a Boston hotel, knowing it would knock a few thousand dollars off the price of tuition. “I went to any single event that gave me money,” said Mc-Kee, who also worked with Campus Bound, a private counseling service, since neither of her parents went to college and they were concerned that she wouldn’t get the necessary attention from her high school. Ultimately, McKee declined offers from Nichols College in Dudley (because it was too small) and Roanoke (because it was too remote), despite their generous aid packages. Earlier this month, she decided to go to Xavier, where she’ll be able to earn both her bachelor’s and master’s degrees in five years and which has an active sports culture. The estimated cost of attending Xavier is about $50,000 annually, but with her aid, McKee estimates that when she finishes she’ll owe about $35,000 in student loans. “I am excited to pay it off,” she said. Tiani Ramos, 17, hasn’t finished her senior year at Brighton High School, but the cost of graduate school is looming. Ramos wants to be a child psychiatrist and knows she’ll have to pay for an advanced degree so is trying to keep her undergraduate costs down. As the oldest child of a single mother and the first in her family to go to college, Ramos expects to shoulder most of the expense of her education on her own. She’s organized the financial offers and costs from colleges into a spreadsheet and is working with a counselor at uAspire, a Boston-based organization that helps students afford college. But it’s still a tough choice, Ramos said. “My mind is mush right now,” she said. 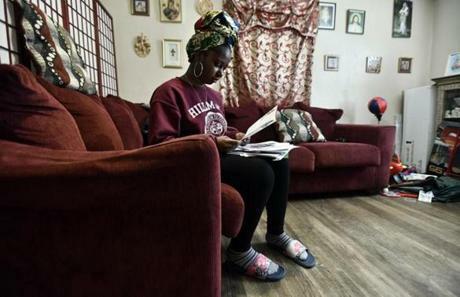 Suffolk University has given her enough scholarships and aid to essentially offset her tuition and fees, but she would have to live at home. Stonehill College gave her $40,000 in scholarships but will require her to take out $20,000 in loans. UMass Lowell’s aid package keeps her loans under $3,000, but she spent summers on the campus and worries it will be too familiar. She’s been accepted into the UMass Amherst honors program and is waiting to receive its financial aid package. And she knows she could also do a year at Bunker Hill Community College to save money and then transfer out. Ramos’s mom, a collections specialist for a debt company that handles student loans, has warned her about the dangers of borrowing too much money. Her guidance counselors have cautioned her that while the large scholarships she has received don’t have to be repaid, she could lose that money and struggle to pay for college if she doesn’t maintain her grades. No matter where she lands in the fall, Ramos said, she’ll try to make the best out of college.